Thanks to support from the National Park Service, Destination by Design (DbD) is developing a 50-mile trail master plan for a section of the Overmountain Victory National Historic Trail in western North Carolina to link Lenoir, Morganton, and Lake James. This plan involves traditional trail planning elements such as a site suitability analysis and preferred and alternative trail routes, but also includes a significant landowner outreach and communication program. The DbD media team developed a promotional video that highlights the significance of this trail and makes a direct appeal to landowners along the corridor. Go to OVTplan.com or click below to see the video. 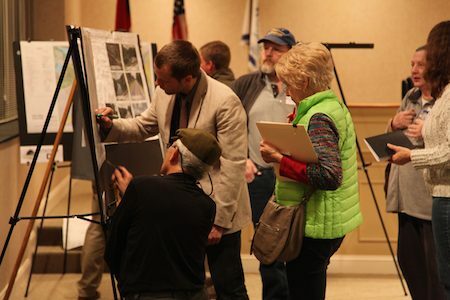 After identifying alternative trail routes, 140 landowners were recently invited to a series of special landowner workshops that included a showing of the video. Landowners then shared their sentiments, ideas, and concerns regarding the proposed trail routes. With this information, DbD will alter the proposed routes and help our clients determine where best to focus their efforts. The Overmountain Victory National Historic Trail is 330 miles in length and includes portions of Virginia, Tennessee, North Carolina and South Carolina. The trail commemorates the significance of the patriot militia that marched over the Appalachian Mountains to defeat the Loyalist army at the Battle of Kings Mountain on October 7, 1780.